Isomers related by chirality are not the only kind of geometric isomers. One other example is cis-trans isomerism in alkenes; that is, different orientations around a carbon-carbon double bond (and other double bonds, in some cases). In cis isomers, there is a non-hydrogen group at each end of the alkene, and they are on the same side of the double bond axis. Figure SC15.1. A cis-isomer of an alkene. Figure SC15.2. 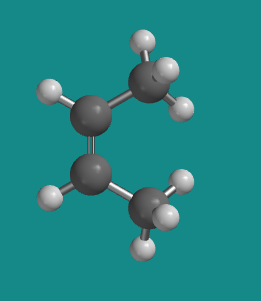 A ball-and-stick model of cis-2-butene. Go to Animation SC12.1. 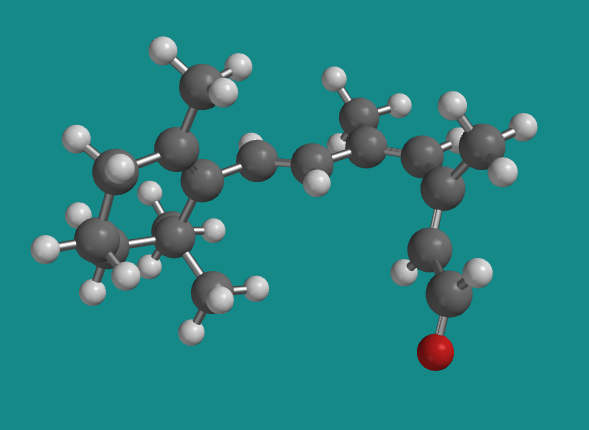 A three-dimensional model of cis-2-butene. In trans isomers, there is a non-hydrogen group at each end of the alkene, and they are on the opposite sides of the double bond axis. Figure SC15.3. A trans-isomer of an alkene. Figure SC15.4. 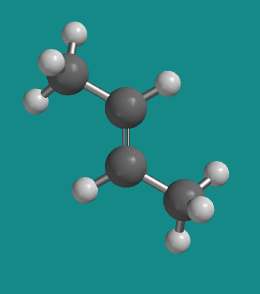 A ball-and-stick model of cis-2-butene. Go to Animation SC12.1. 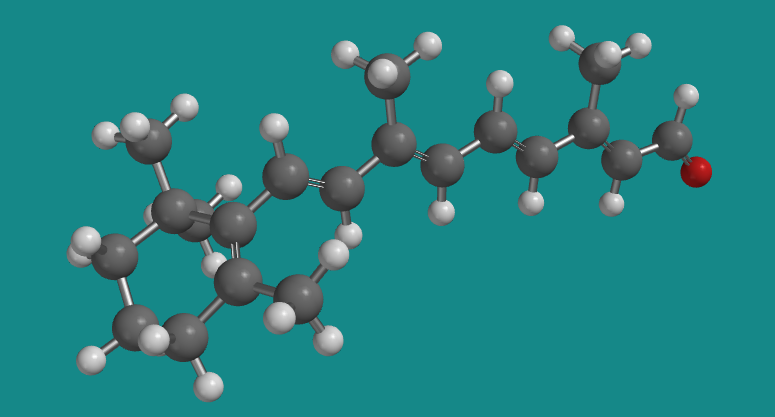 A three-dimensional model of trans-2-butene. In cis isomers, the non-hydrogen groups at each end of an alkene are on the same side. In trans isomers, the non-hydrogen groups at each end of an alkene are on opposite sides. 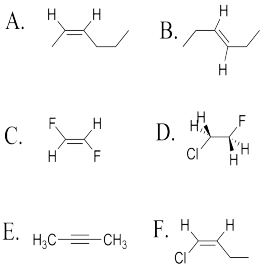 This kind of isomerism is different from the shape changes seen in saturated hydrocarbons such as butane; that is, compounds that have only single bonds, and not double bonds, don't have these specific isomers. (However, saturated ring structures can have cis and trans isomers; in that case, the terms describe whether two groups are on the same face of a ring or opposite faces). There is free rotation in butane, because the single bonds that hold the carbons together are not as sensitive to the orientation of the tetrahedral carbons at either end of the bond. In contrast, turning the trigonal planar carbon at one end of a double bond would disrupt the p orbital overlap that forms the pi bond. That would cost a lot of energy. Cis and trans isomers do play important biological roles. For example, one of the proteins responsible for vision is rhodopsin. Rhodopsin has bound to it an organic compound called retinal (the oxygen in retinal is replaced by a nitrogen in an amino acid side chain in the protein to form active rhodopsin). One of the bonds in the active form of retinal has a cis configuration. You may know from conformational analysis that there would be some crowding between the groups that are held close together on one side of the double bond. That crowding, sometimes called steric strain, causes an increase in energy. Figure SC15.5. An isomer of retinal, important in vision. Figure SC15.6. A ball-and-stick model of 11-cis-retinal. Go to Animation SC12.1. A three-dimensional model of cis-retinal. However, if a photon is absorbed by the molecule, an electron can be excited from a ground state level to an excited state level. This electron would then occupy a pi antibonding orbital, weakening the pi bonding in the system. That makes it easier for the molecule to rotate, and it does so. Once free to rotate, the molecule more easily adopts a more ope n, less folded shape. It becomes the all-trans isomer. Figure SC15.7. An all- trans-isomer of retinal. Figure SC15.8. A ball-and-stick model of transretinal. Go to Animation SC12.1. A three-dimensional model of trans-retinal. The shape change in retinal is important because it is bound to the rhodopsin protein. The protein is folded around the retinal, so that when the retinal portion changes shape, the protein has to undergo a conformational change in order to fit around the retinal. The resulting conformational change of the protein allows a signal to be sent telling the brain that light has been detected at a particular place in the eye. Determine whether the following molecules are cis, trans or neither.